AMI: SPISim’s IBIS-AMI modeling, validation and analysis features are the most economic yet efficient AMI modeling flow on the market. Generate spec./datasheet based, cross-platform IBIS-AMI models supporting different combinations of FFE, CTLE, DFE, CDR, AFE, DSP filters etc. 10+ parameterized Analog IPs pre-built in C/C++, compiled across platofrms, met AMI Spec. tested with major EDA’s channel analysis tool, are ready to be assembled as AMI model without any coding efforts. 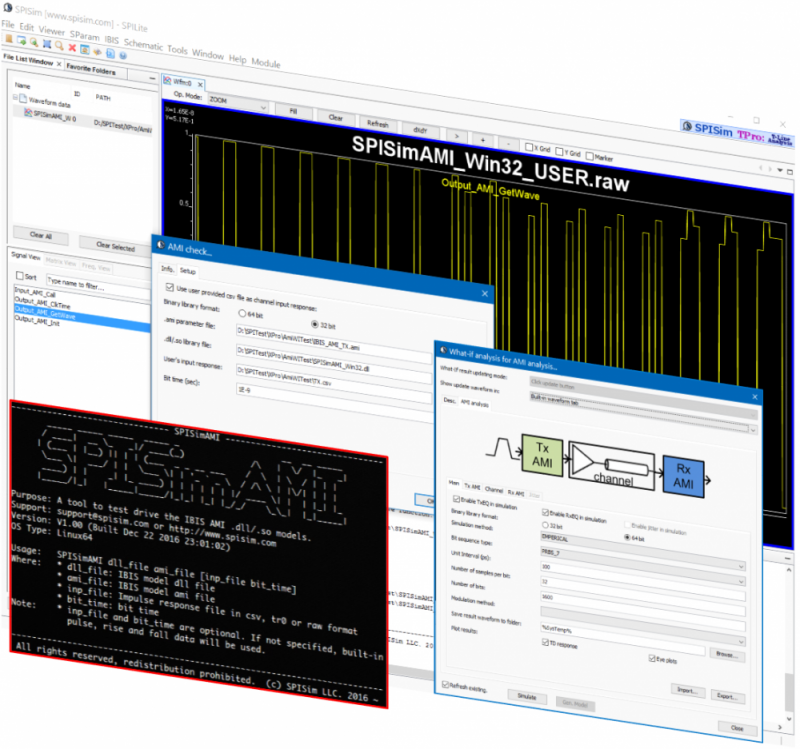 Drive SPISimPro generated or user’s existing IBIS-AMI models with either built-in response, including PRBS, or user provided response, view results instantly within SPISimPro. Script based AMI prototyping without any coding or compilation. Support CPython. 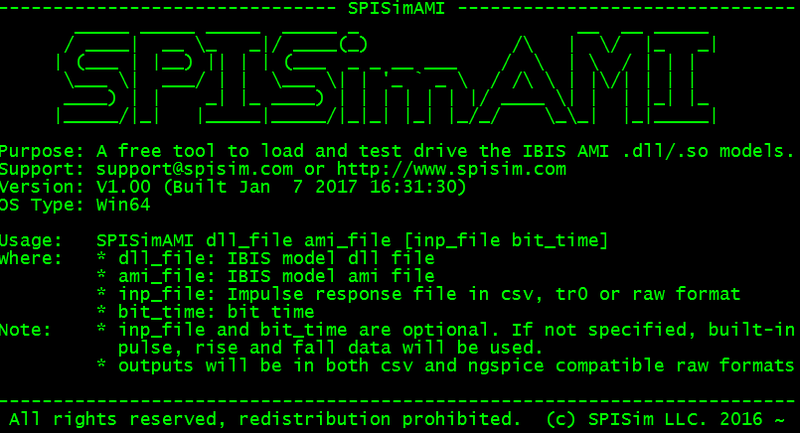 [SPISimAMI.exe], for AMI model testing, development and publishing. 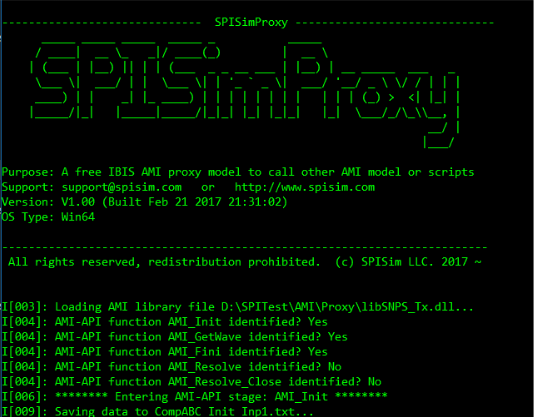 [SPISimProxy.dll], interface model enabling AMI development using matlab, python, perl or other scripts without C/C++ coding and compilation. Licensed version also provides C-Python embedding (so that model recipients do not need to install Python interpreter) and encryption to protect developed AMI scripts’ IP. Table based parameter setup or sweep to form certain AMI combinations. Adjust parameters, view result waveform and click a button to generated associated AMI model all within our SPISimPro environment. Does more than latest golden IBIS checker… will check and drive model. Command line version is free to download and use. Can also be used as model driver for IBIS-AMI modeling development. Very useful for exchanging data and debugging AMI models between model publisher and users. No need to acquire 3rd party EDA tools on both sides. Develop or analyze your AMI model with our proxy based AMI model. Use your matlab, python, perl or other scripts to do AMI prototype/analysis. No C/C++ coding, compilation or AMI API implimentation needed. Advanced feature include C-Python embedding. You can use python and its rich scientific/engineering libraries (e.v. SciPy NumPy) in your script. SPISimPro integrates with Python directly. Model recipients do not need to have Python interpreter installed. Also included in advanced features is encrypted script support. No IP leaks! Use user’s Tx and Rx AMI models to perform link analysis without using 3rd party simulator or EDA tools. Features for free tools, SPISimAMI and SPISimProxy, are listed on their own product pages. Spec. AMI model generation are built-in in SPISimPro. Visit [SPISimAMI’s Product Page] for usage, video demo and details. Visit [SPISimProxy’s Product Page] for usage, video demo and details. Windows 10 and RHEL/Centos distro 6.0 or newer for Linux are recommended.